As a preteen in the mid 1980s I was all about trendy accessories. From Banana Clips, to Mood Rings to Parachute Pants and more, I had to have it. One accessory I couldn't resist, were colorful charms. 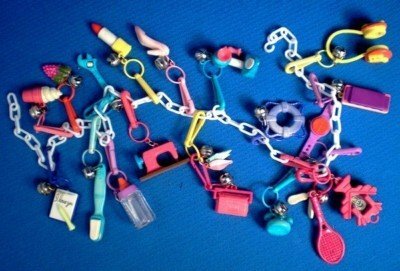 These cute plastic charms or trinkets included sweet irresistible items such as tennis rackets, hot dogs, cupcakes, rainbows, ice cream cones, lipsticks, toothbrushes, smiley faces and even Care Bears -- you name it! 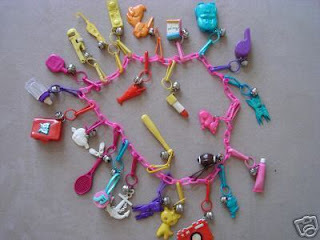 I collected dozens and dozens of these sweet plastic charms. They were a 1980s fashion must for teen girls! Most charms had small silver bell attached to them so everyone knew you were near by draped in your adorable charms. 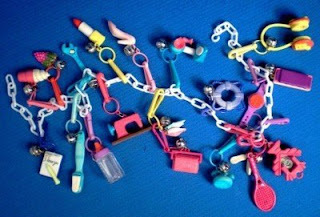 Typically these charms would dangle from colorful plastic chains which allowed the charms to easily hook on. We'd get creative and wear the charms on our sneakers, attach them to our spiral notebooks, book bags, bike baskets and more. I still have my charms in a trunk at my mom's. I should really sport those suckers, but I guess as a woman approaching 40, I'd look a bit off, no? Original, vintage 1980s Charms can be found on eBay and Etsy. These were my absolute favorite things back in the day. They lasted into the 90's and I grew a fabulous collection of them. I would still rock them now if I could find mine, but I'm a freak like that. I *loved* these in fourth grade. I wish I had kept them. I may go on e-bay! Another wayback flashback on your site. Too funny- and the bells! It was like hanging out w/ dozens of kittens! Wow! I completely forgot about these!! I say totally rock them! I'm working my way to the big 40, and I say screw it and wear what you want. I wish I had collected those. They're adorable and fun. Despite rumors to the contrary. I neve wore these things. I did however, find lot's of them in the carpet and imbedded in my feet! Oh my, I actually remember seeing those things when I was in school. All the "cool" girls had them. I had the shoe charms though I do not remember how I acquired them! Oh, I was just thinking about these recently! Thank you for showing some. I have to dig through my parents' attic and see if they're still there. Never had any of those myself, and I don't remember them; however, we lived out in the middle of nowhere. I barely remember the plastic charms. and who cares how old you are, rock them! My sister had a boatload of these. They were always all over our floors. Drove my mom crazy. I totally do NOT remember these at all! Maybe they weren't as big back home in Canada? As a guy, I didn't get into these, but I do remember them. When I was a kid, we used to make gum wrapper necklaces... not the same, but fun. These were the silly bands of the 80's & 90's!!! They were great! I loved them. Ha!!! I totally forgot about those! You have resurrected a really dusty memory, my friend. Really dust. Love it! i had tons of them. I wish I still had mine, I had several hundred of them and after I quit wearing them they hung on the back of my door for years. My last banana clip broke a couple of years ago and I cried! Real tears, I loved those things!